Kiefer Sutherland’s return as Jack Bauer highlights an excellent mix of shows and sports this week when 24: Live Another Day premieres on Fox at 8 p.m. on Monday. 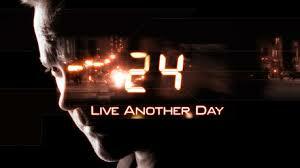 It has been four years since the last episode of 24 when there were plans for a movie franchise. Ultimately those did not come to fruition and so the show returns for a 12-episode run. Left unsaid is the implication for all involved that a successful return will lead to a further series next year. But for now the focus is on Bauer and his current exile in London after the events of Season 8. I’ve always liked Sutherland as an actor not least because it is tough to follow a successful father into the same business. Bauer is a great role, but my favorite remains that of Athos in the vastly under rated 1993 remake of the Three Musketeers. Chris O’Donnell, Charlie Sheen, Oliver Platt and Tim Curry are all at the top of their game along with Sutherland and the often over looked Michael Wincott then playing Cardinal Richelieu’s henchman Captain Rochefort. Imagine then my pleasure at learning that Wincott is in 24: Live Another Day as what the producers label as a “charismatic almost prophet like figure.” Wincott has this wonderful presence on screen and his voice is just mesmerizing. As such I’ll be very curious to see where the show takes the character. Bauer’s old boss James Heller played by William Devane is now the President and his daughter Audrey Raines (Kim Raver) has recovered from the traumatic events of Season 6. Add in Mary Lynn Rajskub as the ever-loyal Chloe O’Brian and the foundation feels right. Those of you that are Amazon Prime customers can catch up on any of the eight previous seasons of 24 via the streaming service. Tuesday’s highlight remains NCIS, which continues unabated as one of the, if not the, best shows currently on television. While many loyal fans of the series still have not got over the departure of Cote de Pablo’s Ziva David, the show has continued on strongly with Emily Wickersham as Eleanor Bishop. I was always an unabashed fan of Sasha Alexander in the role of Caitlin Todd and like how the writers of the show have created three truly unique characters over the years. Bishop isn’t Ziva; but the strong work of Mark Harmon, Michael Weatherly and Sean Murray has compensated for any let down over de Pablo’s decision to exit the show. Hidden away at 10 p.m. on Wednesday’s is The Americans on FX. Another, like the Arrow, that I didn’t catch initially when it started broadcasting. I am currently watching Season 1, also on Amazon Prime, before getting into the current season. Making two Russian spies the protagonists in a television show is a gutsy move and one of the reasons it didn’t make my watch list. My presumption, which was wrong, was that the show wouldn’t have the characters act logically and with evil intent when needed. So far I love what I am watching as the writers constantly pull surprises and there is a fascinating physicality to the performance of Keri Russell. Throw in a great sound track and The Americans is already in the list of my top ten shows. Thursday the extreme football geekdom that is the NFL Draft is on ESPN at 5pm. I’m somewhat in the minority in that while I understand the reality of a made for television event and the ratings that the first round draws, I much preferred the all-weekend presentation that used to be. Draft analyst Mel Kiper Jr. remains supreme for draftniks and host Chris Berman controls the chaos usually with aplomb. The show works best when the likes of Chris Mortensen, Ron Jaworski and Merril Hoge hold forth with inside information and strong opinions and I’ll be curious to see who ESPN have working this year. Sunday I’d usually watch Crisis and Believe on NBC. Both are mid-season replacements and unfortunately all indications are that they will not be renewed. That’s a shame and the sort of shows that would be nice for Netflix, Hulu or Amazon to pick up. NBC has scheduled Rosemary’s Baby in their place and so instead I’ll be watching the incomparably beautiful Rachel Weisz in my favorite role, that of Evelyn in The Mummy Returns at 6pm on AMC. Weisz plays such a strong, competent woman in the film which is a fun ride from beginning to end.